It’s not a complicated process, but there are some things you need to know to get started. In this article, we give you the lowdown on everything you want to know about running a successful pop-up event. A pop-up is a store or business that opens quickly at a location and only lasts for a short period of time. It may seem like pop-ups recently started, well, popping up everywhere, but they’ve been around since 1298. That year, Albrecht I of Austria gave the citizens of Vienna permission to open a December market to peddle Christmas goods. And the pop-up shop was born! Los Angeles gets the credit for popularizing the trend in the U.S. about a decade ago. Today, pop-ups cover various industries from business to food. Celebs will throw a pop-up party now and again and chefs are getting in on the one-night pop-up restaurant action. 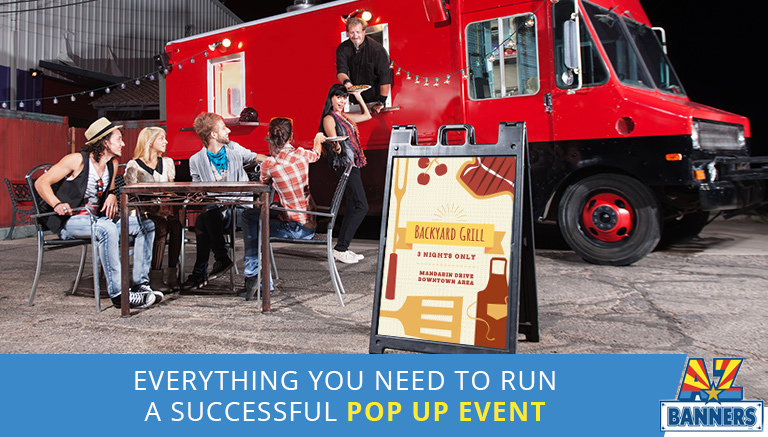 In business, pop-up events seem unexpected but there’s a lot of planning that’s involved. They’re a great way to bring brand awareness to people who aren’t familiar with the company. In a way, pop-ups are a form of guerrilla marketing. First things first, check with your local municipality on the permit situation. Depending on where you’re thinking about opening your pop-up, you may need permits or insurance. Also, check for location restrictions, like parks and public parking lots. You want to attract attention from potential customers, not local authorities. Get advice on what venue works for your pop-up by reading online reviews. The public has no qualms about spilling the beans about what they did and didn’t like about a location. There was a time when pop-ups seemed spontaneous. Today, they’re so common that letting your audience know ahead of time increases your chances of success. Have a countdown on your social media pages and make sure you cover all the who’s, what’s, and where’s of your event. Entice them to stop by offering a giveaway or discount if they mention your social media post. Be creative! Get ideas from other pop-up events in your area by checking them out. Be the customer and take notes on what you think works for your pop-up. You want your pop-up to be fun yet organized so make sure you have enough staff so customers don’t grow frustrated by not getting help. Remember, your pop-up is a way to market your brand, so be unique and stand out! Now that you know what it takes to plan, open, and run successful pop-up events, you need to get your space top-notch. Banners and tents are inexpensive, durable, and easy way get your brand’s name and logo out there. At AZ Banners, we have everything you need to bring people’s attention to your pop-up. We have pop-up retractable banners, feather banners, step and repeat photo backdrops, tents, and much more. We also have vinyl decals and stickers so you can make sure your brand stays with your new audience long after your pop-up event closes. Contact us today for a quote or to get more information on how AZ Banners can make your pop-up stand out. For quality, eye-catching pop up banners and signs, contact AZ Banners. We can help make your pop-up event a big success! Get started today by requesting a quote online or calling 480-458-8128!